97% of Americans don't get enough of it, bananas really don't have that much of it, and it keeps our blood pressure at a healthy level. What mineral am I referring to? Potassium. This mineral does more than keep our hearts healthy, it is also an important electrolyte that supports muscle growth, muscle contraction, and proper hydration. Before listing the foods that contain high amounts of potassium, let's go over what potassium does. Electrolytes are minerals in our body that literally produce a small electrical charge. Thanks to electrolytes all of our muscles, including the heart, contract and retract. Calcium, magnesium, potassium, and sodium are the major electrolytes in our bodies. Magnesium and calcium work closely with potassium, but not as closely as sodium. In our muscle cells there is a fine balance between sodium and potassium. 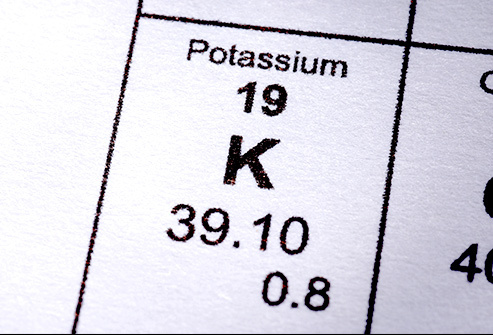 Potassium helps regulate the amount of sodium in each cell. When there is not enough potassium in the cell, the cell can swell due to an excess of sodium inside. The body excretes potassium much more than sodium to keep the balance just right. For most American's this is a very bad thing. The Standard American Diet or SAD is full of salt in processed foods. Our bodies hold onto salt and excrete potassium. This means the ratio between these two minerals is thrown off and side effects such as high blood pressure occur due to irregular heart contractions and fluid imbalance. Potassium is so poor in the American Diet due to the lack of fruits and vegetables consumed. Potassium counteracts the negative effects of excess salt, but no one is eating enough potassium and everyone is eating too much salt. You could supplement with potassium but the highest dose you can find is 99mg which doesn't get anywhere close to the Recommended Daily Allowance which is a whopping 4,700mg. Rather you can get potassium through food, and it is more safe. To conclude, reduce your amount of salt (sodium) in the diet because our body can reserve it just fine. Eat more potassium because our body can't reserve it well. When we have too much salt in the body and little potassium our hearts and other muscles suffer. If you want to stay fit and healthy, eat more potassium and less salt. As you can see high potassium foods are plants and high sodium foods are animal products. If you think you can't get enough nutrients through plants alone, well... keep reading my blogs. I will continue to talk about getting plenty vitamins and minerals through plants here. Thanks and feel free to comment or leave a question.